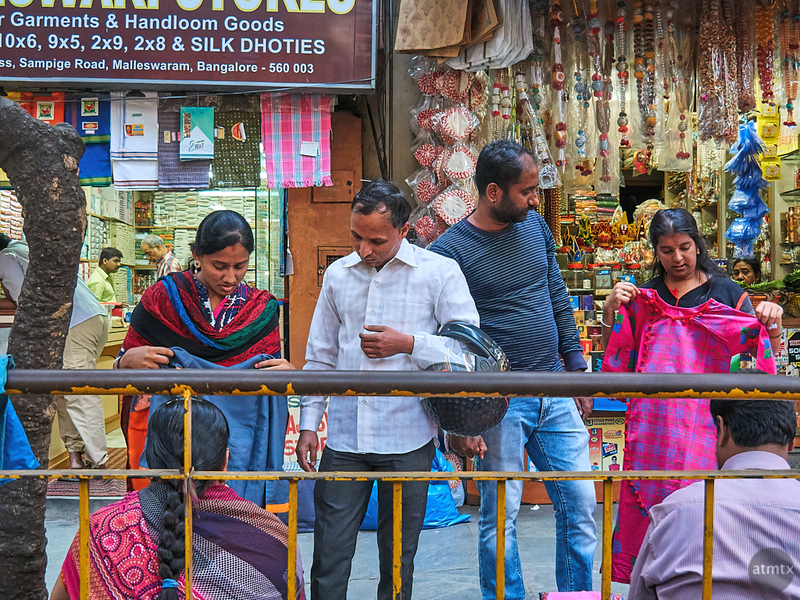 Here’s one more photograph from Malleshwaram, a popular shopping district in Bangalore. I talked yesterday about sitting in the car, waiting for Sahana, our model for a shoot we had planned in this neighborhood. I was taking in the active street life happening before me, switching between my three cameras. I shot today’s photo with the Olympus OM-D E-M5 Mark II at a 40mm equivalent. So the framing you see here is similar to what a typical person sees in real life. I’m pretty sure I didn’t catch the extent of the symmetry I later discovered during post-processing. However, I was amused by the two couples looking at clothing. The two people sitting by the fence are street vendors. I’m assuming the men are husbands looking over their wife’s picks. Were the men truly interested or were they dragged into the shopping excursion? Or perhaps, they were just walking down the street when something caught their eye. I suppose that’s the benefit for street vendors. The barrier to entry for potential customers is really low. For the record, I actually like shopping and not just for cameras and electronics. I often go food or clothing shopping with my wife. She even trusts my judgement and asks for my clothing opinions. I’m no clothing expert of course, but perhaps my skill or curse for observing details, honed even more via photography, comes in handy.